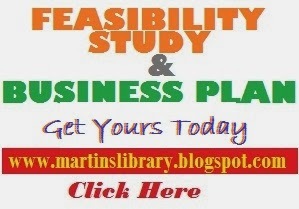 The main purpose of this proposal/business plan/feasibility study is to support a loan/grant request for a N5,000,000 (Five Million Naira) grant from (Name of Bank/Investor Here) to purchase brand new equipment and inventory as part of the financing for a start-up sole proprietorship Martins Library Paint Company (Note; this name is a sample). 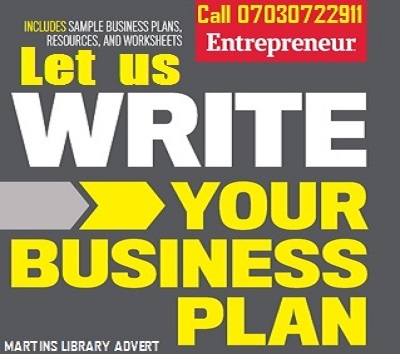 The business will be owned by Martins Library Team and will be located at (write your complete address here). The owner will provide a minimum of #1,000,000 (Five hundred thousand Naira) in initial equity for startup. The paint factory (production plant) is expected to commence production with 600 drums daily and expend to 1,020 drums within the next 3 years using a 70% increase rate. Other products will also include; Martins Library Protective wood sheen, Epoxy, Flex, industrial coat, and Anti-corrosion system for metals and plastics. To add or increase the value of buildings. We will provide coatings of high/luxury quality at affordable prices; making our paints a product of choice for middle class customers. This would be achieved by adopting a clearly defined market positioning. 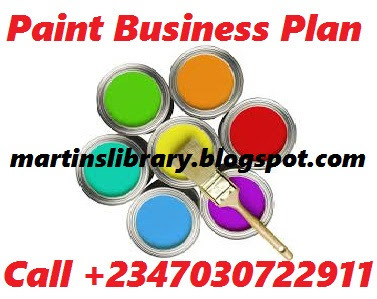 Creating jobs at a full funding, Martins Library Paint Company (our business) would employ about 20-30 employees (specifically citizens in Nigerians) (you can use your country name e.g., Ghana, South Africa, United States, Netherlands, United Kingdom e.t.c. ), who will be empowered with adequate salaries and skill. They would include Managing Directors, factory/logistics Manager, production manager, production supervisor, lab attendant, factory hands, store clerk, accountant, marketers, cleaners, security, and driver etc. The paint containers will not just have a digital graphic print but also an engrossment. We would include a 10 litres paint bucket to the customary 20 litres and 4 liter buckets. The Paint Products will be sealed in crested plastic bags before plastic containers. Multi-flek series: Multi colour paint spraying using air compressor machines. Pearl series: Multicolor luminous spray painting with embedded crystals and comb rakes. An effective and well defined growth strategies. Efficient marketing and distribution strategy. (iv)Great quality controlled production. The best customer, employee, distributor, supplier motivational incentive programs in the industry. Turn Over - To generate reasonable turnover with manufacturing and sale capacity of over 7 million liters of paints annually. This will enable us to become sustainable, create more jobs and expand our operations. We achieve this by selling to diverse markets, ensuring customers’ loyalty and optimal use of our facilities. Customer satisfaction - We shall go extra mile to ensure that all our customers are happy. We intend to do this by taking time to understand their needs and assisting them to make better decision. Effective listening, empathy and rapt attention to customers shall be our watchword. The vision is to establish a leading indigenous paint industry in Nigeria that will be environmentally friendly and compete favourably with other leading paint industries in the world through techno managerial excellence. To bring new technology to the surface by surpassing the needs of our customers through the production of quality paint products and provision of services unrivaled in the paint industry. INNOVATION - We must develop innovative ways to produce and sell. We plan to be ahead in technology, quality, design and packaging. MARKET ESPIONAGE - We aim to out-compete and have inside information of a competitor operations, his products, prices, and marketing strategy. This will helps us react adequately. HIGH/EFFECTIVE DISTRIBUTOR BASE - The products will have a wide geographical spread through effective distributors. A company must be able to convey their vision and mission with passion to their distributors. CUSTOMERS - Our management will must invest in developing a strong brand name and strategies to induce strong brand loyalty. HIGH PRODUCTION CAPACITY - We intend to have a production capacity that is commercially feasible. Being bigger/larger means better access to materials, credit and producing at lower costs due to economy of scale. SKILLED HUMAN RESOURCES - We must hire qualified personnel for crucial positions. We already have a good employee development plan. People or organizations repainting existing buildings. Our customers are building contractors, general contractors, concrete subcontractors, builders association, housing consultant, development agencies, construction workers, civil engineers, architect, land lords and individuals. Individuals building houses, Building material markets in different (our) state (and north east west south east). Construction firms in the state handling building sites, Marketers of paints in (mention you location e.g. Lagos, Aba, Onitsha, Abakaliki, Enugu, Abuja, Nnewi, Portharcourt, Warri, Zaria, Kaduna e.t.c) and its environs, Household/industrial consumers, Cooperate bodies, agencies, MDGS, MDAs and estate managers. MARKET FUTURE FOR THE COMPANY: At stabilized production level, Martins Library Paint Company will have a vast distributor network that covers most major cities in Nigeria. So the geographical market is national. MARKET SIZE: Checking with the 25 million size of existing buildings in Nigeria which statistics shows that about 50% will have need and ability to pay for a fresh coat of at least 250 litres of paints in every 5-10 years at an average price of N150/litre. Our market size come to (12 million buildings x 250 litresx N150) divided by (10yrs). This comes to an annual yearly consumption of about 300 million litres and about 45 billion Naira annual sales. ECONOMY HOME OWNERS/RENOVATORS - These are home owners/builders of low budget buildings. Their buildings are normally residential houses in mass government assisted housing, sparsely developed areas or rural setting. MIDDLE CLASS HOME OWNERS/RENOVATORS - This group have middle class income and building budgets. Their buildings are mostly commercial or residential houses found at city centers and newly developing urban areas. This segment is easily the most important group targeted by most paint companies. LUXURY HOME OWNERS/RENOVATORS - These are home owners/builders with high means and building budgets. These are mostly high rise commercial buildings, hotels, mansions and detached or semi detached buildings that can be found that can be found in city centers and luxury estates. PRICE - Economy class customers are most likely to be affected by price more than quality. An increase or high price will easily see them move to a competitor product. This group has the least brand loyalty. PERCEPTION - Middle class customers are most likely to be affected by innovation, technology and perception. They easily copy what they think is trendy or what they perceive is used by high income earners. They are less likely to move to substitute product. EMOTIONS - Luxury class customers are most likely to be moved by technology and emotions like(ego and prestige). They easily go for products of very high quality that makes them stand out. They have the best brand loyalty. Online adverts - This is usually the easiest and most neglected means. We will have an aesthetically designed website that fully describes our products and benefits. We will also have our presence in social media like Facebook and twitter for easy interaction with our customers. Magazine adverts - We will make few magazine adverts, mostly at the pre-launch of our products. This means of advert is effective but might be above our advert budget at the beginning. This is also a major way the industry markets her products. Trained marketers working for our distributors market building sites in different cities with our catalogs, color chart, paint sample and other promotional materials. We will develop a multitude of commission agents who earns substantial commissions on sales made as a result of their introduction. We prefer businesses or individuals relevant to building or seen as an authority on the product type. Our chief target will be painters and contractors. samples and go over matching colour combinations with the aid of our catalogue and a marketer. Customers will be encouraged to return unused product to our point of sale and get full cash back. Will run promos like; buy 3 drums (60 litrs) get 4 litrs free. PRICE - An increase in price of economy products will most likely result in a drop in sales. The economy market segment will greatly move to a competitor product of unchanged price. Middle class customers- price changes will not affect this segment as dramatically. Although to a small extent, an increase in price of premium quality products will see loyal customers consume more (increase in sales) of economy class products of same brand. Luxury class customers - increase in price is least likely to cause a change in sales volume in this segment. However a wide increase in prices will see them shift to substitute products like tiling and stone cladding. SEASONAL ENVIRONMENT - There is always a significant drop in sales of paint products during the raining season because construction jobs, especially finishing are mostly suspended in this season. There is also a corresponding increase in sales during dry season. QUALITY - increase or improvement in quality will decrease sales volume if it comes with an increase in price especially in the economy and middle class market segments. Effective distribution network. Customers need a location that is convenient and accessible We need to be mobile and also have depot in strategic locations. We intend to build a database of customers and call them to know when to come and deliver the goods to them. We shall equally have well maintained equipment and reliable facilities that can respond and give you what you want without incessant breakdown. Large /diverse market: We need to serve large market in order to be sustainable and keep our machines busy. Therefore business Location is paramount for us. We shall situate the business in a place accessible and convenient for our customers so that we will be able to cover different segments of our market. Also, we shall have peculiar Packages for different market segments. CERTIFICATE - The first point of registration is incorporation with corporate Affairs Commission (C.A.C). This usually starts with filling a name search and ending with issuance of CERTIFICATE OF INCORPORATION and true copies of ARTICLE AND MEMORANDUM OF ASSOCIATION. This is the basic registration for private liability companies. TAX REGISTRATIONS - after the basic incorporation, one must register his company to the different tax arms of the government for PAYEE (state), VAT and Company income Tax (FIRS). On full registration his company gets his documentations bearing a unique TIN number (tax identification number). PERMITS - the next important regulation is obtaining zoning/housing permits before factory construction. Health and environmental permits also need to be obtained from both ministries. All local government permits and levies should also be factored in. OTHERS - one will also need to join promotional/regulating bodies like SON (standards organization of Nigeria), state chambers of commerce and industry, manufacturers association of Nigeria, etc. INSURANCE - one will also need to undertake all compulsory insurance ( group life, occupiers liability and comprehensive auto) and some optional ones. The industry shall have a staff strength of twenty (10) with production capacity of 600drums (one drum = 20 liters) a day for a Start. Since the population of (Name of State here) where this industry is to be sited is about five million people, and the entire South East is about twenty million (30M), enough and adequate manpower is assured. The projected 600 drums a day is as a result of different colours involved and also different types of paint products. We have emulsion paints, texcoat paints, these are water soluble. There is also oil and marine paints, there are resin and soluble in solvent. The industry will make a substantial quantity of these paints available during her productions so that what is demanded by the customers is supplied. This will strengthen the industry as a result of the availability of the products irrespective of the type and colour. Distribution - apart from key distributors, we will put in place wide small-scale sub distributors known as SAMPLE SHOPS which will not be more than 3 in a city. Our distributors will be chosen based on their passion and integrity, not the size of their pockets. In fact, we will encourage more women entrepreneurs to become distributors of our products. Our distributors and their key staff will receive from us free regular training on winning selling strategies. Technology - the adoption of a production technology and process that would be efficient, cost advantageous and ensuring great quality. Distribution Base - Unlike my competitors, we presently have zero distributor bases. Will set aside 1-3 months before factory production commences (pre-launch period) to marketing effort dedicated to distributor acquisition. These efforts will include adverts on national magazines, online adverts and face to face marketing by 3 company trained marketers, headed by myself. The weakness of the industry will result from epileptic power supply, short supply or scarcity of fuel needed by the industry. Unfavorable government economic policies and programs like heavy taxation or multiple taxation. The opportunity for the industry lies in its feasibility and viability. Since almost everybody in Nigeria is embracing the culture of clean and green, decoration and beautification, and with company's environmental friendly philosophy, the entire Nigeria is the market for the products. The privatization policy of the federal and state governments has created favourable climate for private sectors investment. Another opportunity being that the World Bank assisted rural electrification and water schemes has created favorable environments which cottage industries can utilize to advantage. Expansion with new technology - Paint making controls 90% of the coating industry, with the remaining 10% being made up of substitute products which are basically variant ways of dispersing pigments. Paint making have the capacity and know how to diversify by gradually adding these product variants to their stable. Bagged coloured cement- this is basically pigments dispersed in Portland cement. Tiles - These are machine applied graphic pigment prints on hydraulically pressed clay bases. Emergence of Substitute Products - initially paints controlled a 100% share in the coating industry but now has to contend with substitutes like epoxy premixes, stone veneer, metal boards, tiles and sand blasting. Global warming, this may result from some environmental outbreaks caused by climatic change nowadays. This may affect the colour pigments and other chemicals used in paint production. This is anticipated future trend; every precautionary measure shall be taken to remedy the situation in any event of such occurrence. In this case the policy of government through the National Environmental and Regulatory Enforcement Agency (NESREA) shall be adopted in order to be on safer side of climatic change and remain in business. Inadequate fund to run establishments is always a threat to any given establishment, since fund is the life wire of any organization, shortage in funding or little or no access to fund when required will affect the production capacity of the industry especially when there is speculation on increments in the prices of raw materials and there is no fund to get enough of the materials to store up before it increase, this will go a long way to distort the production schedule of the industry especially new establishments the like this business proposal. There about 125 good selling brands in Nigeria with most being regional players. Only about 45 brands can be found all over Nigeria. DULUX - Dulux is an American franchise operated in Nigeria by CAP Plc, a subsidiary of UAC, Lagos. This is the best-selling brand in the world and in Nigeria. This brand targets the middle and luxury homeowner. This is the oldest paint firm business in the area. It has achieved reasonable acceptance in the locale. However they are weak in marketing. INTER-COLOR PAINTS - this is a licensed product of Intercolor Dubai Ltd. They are manufactured in Nigeria by Intercolor industries Nigeria Limited. They are a good selling brand. They also target the middle and luxury home owner segment. This business uses modern gadgets and has been able to attract building contractors. However, his price is high. SHARON PAINTS - By Sharon industries Nigeria. Limited. They are a top selling brand found all over Nigeria, even rural. The initially targeted low income home owners but has recently penetrated the middle and luxury segment with new brands like VINEYARD. GREAT QUALITY AT RIGHT PRICES - our top quality products especially targeted at middle and luxury class customers will incorporate a low water-high acrylic resin mix, high steadfast pigment load and effective additives. These products will be sold at prices that are more competitive than their competitor. we are using more local raw materials (plant pigments) so our unit cost will be lower making us to open up to some market segment that feels that high price is a barrier. AMIABLE CUSTOMER CARE - customers will buy our product from comfortable studio/showrooms where they can relax and make product, colour and design choices with the help of an expert. Our product sales will include a cash back guarantee on proven product damage or over order. We shall always see our customers as partners and serve more like a consultant to them. The industry will take insurance cover with an insurance company in the areas of burglary and theft, and fire outbreak. Workers shall be properly trained on the best practices of material handling since paint production is the type of production process that requires a lot of chemicals. The knowledge of material handling will remain top concern in the production process of the industry. Work safety in every factory is always top priority. The industry will adopt the simple saying "work safe today to work tomorrow." Safety gadgets shall be provided to workers in order to mitigate the risk of accidents in the factory. Routine maintenance shall always be carried out on the process equipment from time to time to ensure at least 90% machine efficiency. This is necessary to avoid machine breakdown during production which can lead to wasteful batch thereby accruing loss or leading to high production cost. Proper maintenance and periodic checks on the process equipment will increase salvage value, thereby yield the expected returns from the investment. The choice of the operational structure is to ensure professionalism and efficiency. The CEO or the project manger co-ordinates the activities of the production through efficient scheduling. Martins Library Paint Company Team members are all degree Holder in science field in . 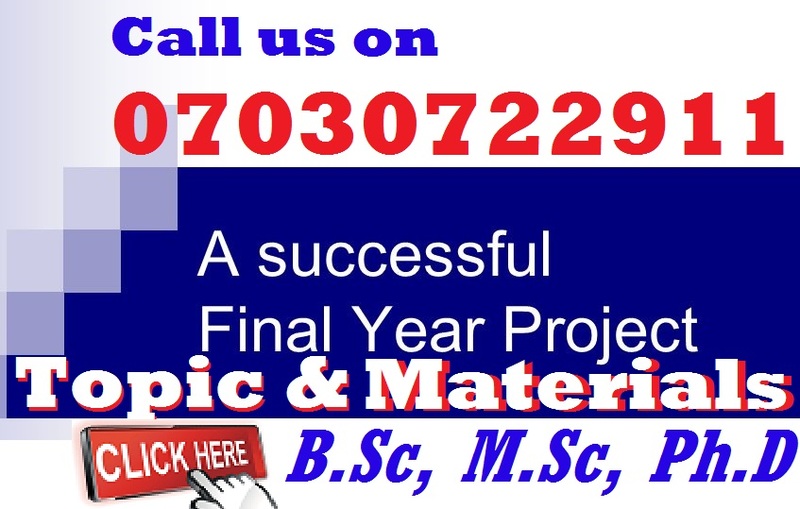 Industrial chemistry, Biochemistry, Industrial Microbiology Biotechnology e.t.c and have taken advanced training in commercial paint making both in basic and advanced clasess. Most of them has worked for over 5 years as a either lab analyst and in other paint company across Nigeria. These team members will bring in their managerial expertise, passion, personal resources and training gained over the years. The manager of the business, shall oversee the planning, organizing, motivating the paint company workers and ensuring that results are achieved. The education and work experience prepared him/her for this role having worked in paint manufacturing firms as quality control officer and production manager, he/she have accumulated reasonable contacts and experience that could make this business a success. The manager has also previously served as a consultant to up to 5 paint manufacturing firms in (put in the locations here e.g. ; Lagos, Abuja, Akwa Ibom, Bayelsa, Benin, Kano or even in United States and/or United kingdom (UK) etc where he/she developed formulations. He will also work with, Mr ABC a M.Sc Holder in Chemistry and has a 5 years experience as a project supervisor in a building construction company, ABC Impex Ltd (this is a sample). He is also presently a director in a Tiling company. His experience at factory production and construction sites, organising of work process, sourcing of raw materials and human resource management makes him suitable to hold the job of Factory/Logistics Manager. Mrs (Name Here) a Biochemist with her training and experience in paint-making, will work as the Lab Scientist in our business. He will formulate precise mix formula for paint brands and be at hand at production as a quality control officer to make sure quality is faithfully reproduced. The production managers shall be three (3) in their areas of specialization. Chemical Engineer: The chemical engineer will be responsible for certification of chemicals as regards its quality and effectiveness before committing into production. Fine Artist: This is the colour specialist, for the industry to maintain consistency in colour. Marketing manger: Advertise and market the product. Inventory/Store keep: Takes care of both the materials and outgoing products. Factory Works: Other factory workers include drivers, security men and other unskilled workers in the factory. All the listed equipment and materials are available in the Nigerian market at Onitsha, Lagos and Enugu. Local fabricators can fabricate few of them and the raw materials are readily available at affordable price. What other capital for this is for the facility set up. This will be modestly fixed using hydraform low cost earth bricks and corrugated zinc coated roofs. Operating expenses like- salaries/wages, advertising/marketing costs, insurance, repairs, depreciation, payroll taxes, bad debts, permits and licences, operating supplies, telephone/internet, vehicle expenses and CSR. The loan will be sourced from a commercial bank/personal investor. The company has researched for 14 months and have spent over N275,000 in research cost, architectural fees and recently started the process of incorporation. An equity of N1,000,000 is intended to be put into this business at start up. However, the paint company management still need the loan/grant to help thus; To finalize registration processes with regulatory/ promotional bodies like S.O.N e.t.c. Pre-launch distributor targeted marketing with 2 trained marketers. will achieve at least 30% facility construction( a store and production stall only). We will also purchase at least 50% of our equipment and office furniture( 2 half barges and mixers, 1 scale, 1 microwave, 1 wheel barrow, 1 computer, 1 desk printer, 1 desk Laminator, 10KVA generator. At 20% production /recruitment. Having established some distributors, we will increase production to 40%, recruitment to 50% and 70% facility construction. delivery truck purchase.